I know I keeping talking about all this zucchini I have, but it is important! If I have a ton of zucchini in my garden, chances are others have a good amount too! That means everyone is going to be searching for new and exciting zucchini recipes! Every person tells me to make zucchini bread, but I think that is too common (and I definitely won’t be able to compete with other bloggers when it comes to SEO on that topic.) 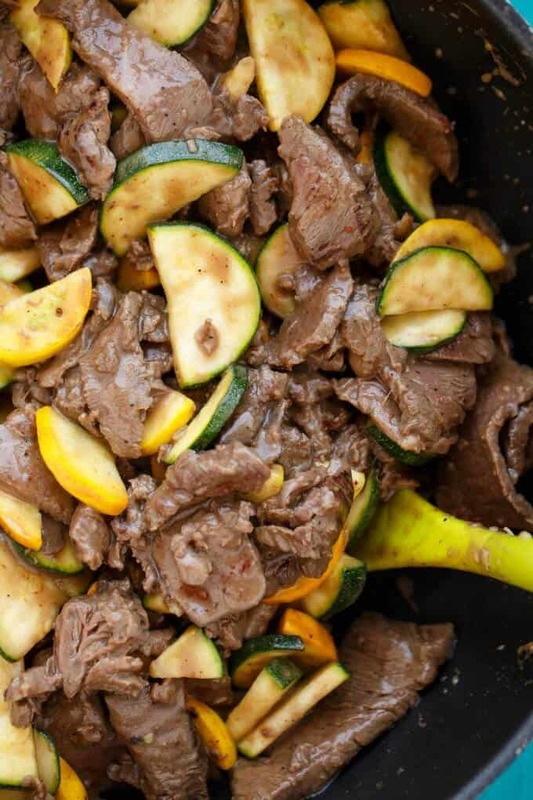 Sometimes a change is nice, and this beef and zucchini stir fry utilized a lot of my zucchini, and the extra beef I had hanging around in the freezer! Now, while the zucchini is the highlight (yes, I grew yellow and green varietals and wish I had grown some grey ones!) I absolutely LOVED the roasted broccoli garnish. A hint of bitterness mixed with the sweetness of rice wine vinegar, it complements the meat quite nicely. To be honest, you could skip it altogether, but I had extra broccoli hanging around and the idea just hit me. I think I ate most of it in my own pasta dishes… But it did make quite a bit! On that final note, like any stir fry, this beef and zucchini stir fry needs to be cooked over a relatively high heat. My problem is overcrowding the pan and I will be honest and say I totally did that here. It all worked out, but high heat is a MUST. You want the meat and veggies browned and crisped. Low heat will just result in a watery mess, especially when it comes to zucchini. You have been warned! 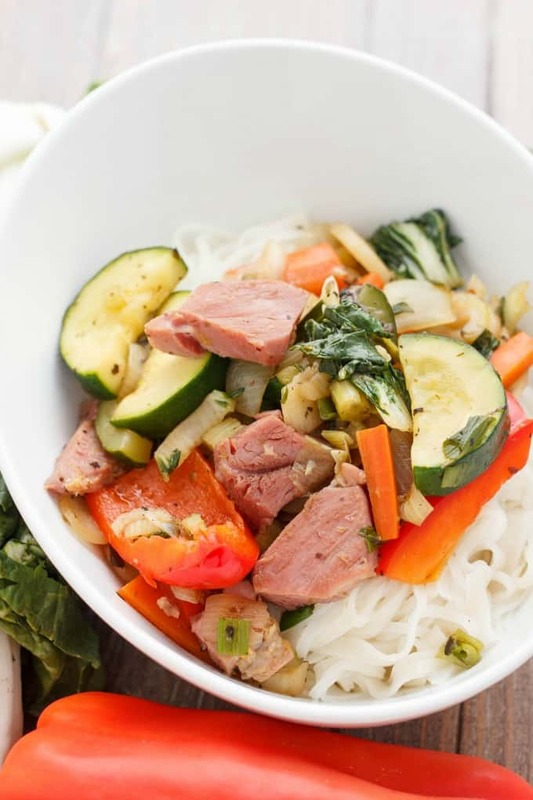 Garden zucchini is the star of the show in this zucchini stir fry! Toss broccoli, oil, garlic powder, and chili flakes together with some salt and pepper. Place onto a baking sheet in a single layer and roast for 15 minutes at 425F, tossing every so often. Place into a food processor and process until crumbly, adding the rice wine vinegar as it breaks down. Taste and adjust seasonings accordingly. Season the beef with salt and pepper. Combine flour, vinegar, soy sauce, honey, salt, pepper, chili flakes, and garlic together. Pour onto beef and toss until nicely combined. Allow to marinade for one hour if desired. Place a wok with 1 tbsp. olive oil over medium-high heat. Add in beef and cook until browned, 5-7 minutes, tossing frequently. Remove from pan. Add in remaining oil, ginger, and zucchini. Cook, stirring often, until tender-crisp, about 5 minutes. Add beef back to pan and cook until fully heated through, 2-5 minutes. 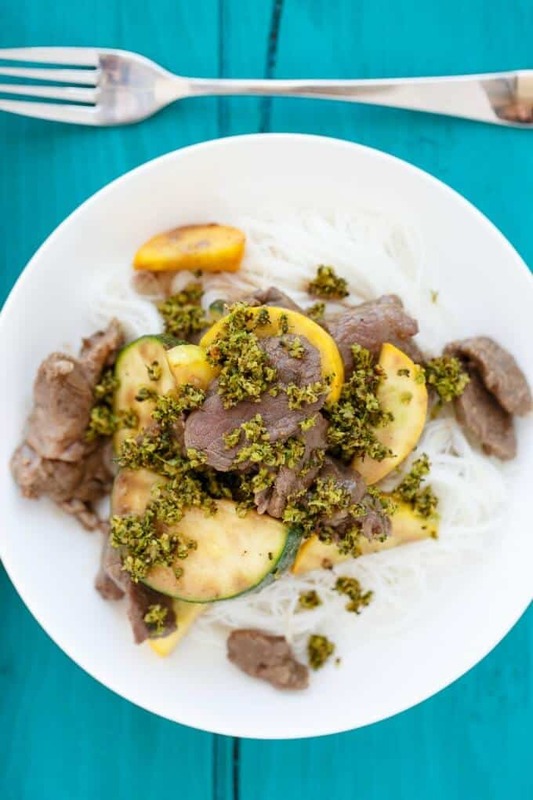 Serve as is, or over rice noodles, and garnish with broccoli! NOTE: I stirred in 1 cup of broth after adding my beef back to the pan and allowed the mixture to boil for 2-3 minutes. It created a nice sauce but did leave quite a bit of liquid in the pan. As mentioned in the instructions, I added a cup of broth in the end to boil off in the stir fry to make more of a sauce. However, I think it added too much liquid so you can skip this part altogether or maybe go with 1/2 cup. The zucchini and beef released enough juices as is! 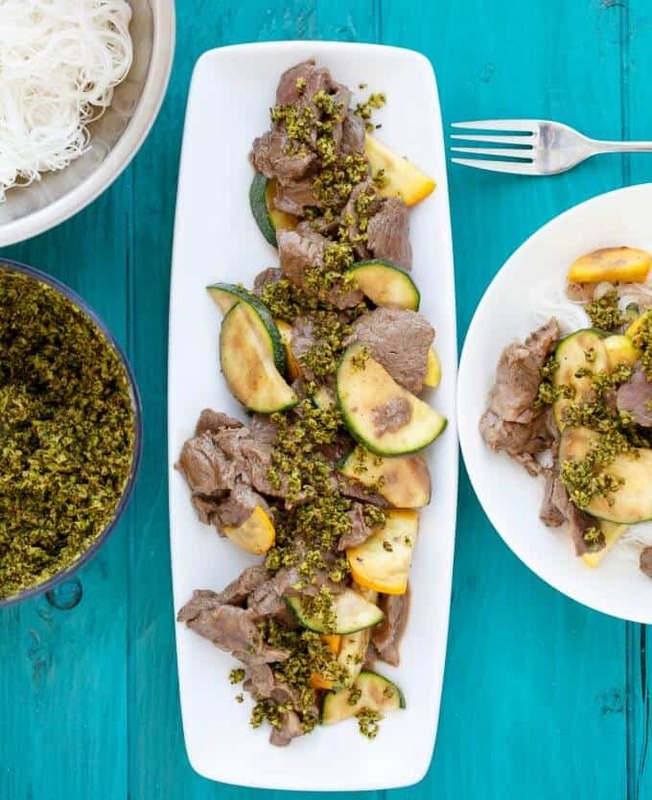 Delicious dinner idea- the roasted broccoli sends it over the top! What a satisfying meal idea! Thank you for the recipe! 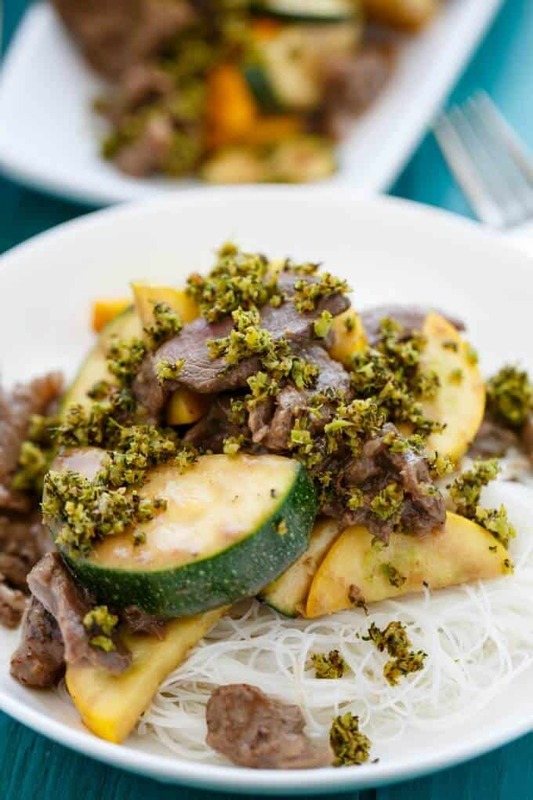 Such a great way to make use of summer zucchini! What an amazing dish! We have plenty of zucchini!! I love stir fry! I just, personal preference, hate vermicelli noodles. Recipe still looks like it rocks though!